The glasses can help those with dyslexia or poor eyesight. 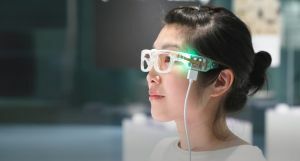 A Japanese company is in the midst of developing a pair of smart glasses that can help those with visual impairments or comprehension problems to read written text more easily. Called the Oton Glass, the spectacles are meant to translate text into audio using two cameras and an earpiece, both fitted to its frame. Half of the lens is a mirror that reflects the wearer’s eyes back to the first camera, which tracks eye movement. That camera can detect blinking, while the other captures text. Wearers use the glasses by staring at text they can’t read and blinking to trigger the glasses. Using Raspberry Pi as the glasses’ computer, the captured words are send to a Raspberry Pi cloud system, which processes the text and converts it into audio played through the earpiece. If the computer system is unable to identify and convert words, the images are sent to a remote worker who can decipher them. The Verge notes that the Oton Glass is a lot like Google Translate, except that the latter requires users to pull out their phone and swipe over text. By comparison, Oton Glass is much easier to use. Its creators hope to help those with sensory impairments, much like the Peri eyeglass accessory that converts sound into lights for those hard of hearing. The Oton Glass lead designer, Keisuke Shimakage, started working on the glasses in 2012 to aid his father, who had recently developed dyslexia. While his father eventually recovered, Shimakage continued development in order to help others with the disorder. Currently, the Oton Glass is seeking funding on Campfire, Japan’s version of Kickstarter. Backers can get a pair of the glasses for 5,000 yen (roughly $47). Smart glasses aren’t a new concept, but it’s difficult to point to any single pair of smart glasses that people have reviewed favorably. It could, perhaps, be that previous products tried to do too much, or were too expensive; hence why Intel’s Vaunt smart glasses stripped out some features, like its camera, LCD screen, and speakers. In contrast, the Oton Glass is for a very specific audience, and its relatively low price could make more appealing to those who want an affordable way to understand the text around them.